Diddy Kong eats a peanut in Brawl, with two other peanuts next to him. Peanuts are items in Super Smash Bros. Brawl and Super Smash Bros. 4 that are produced when Diddy Kong uses his Peanut Popgun and his Final Smash, Rocketbarrel Barrage. When Diddy Kong uses Peanut Popgun, Diddy Kong may charge it, and then fire an individual peanut shell out as a projectile. 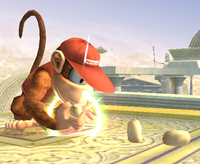 This shell can be caught by another opponent and thrown back at Diddy Kong or another opponent. Diddy Kong can also fire peanuts from his peanut popguns by using Rocketbarrel Barrage. These rapid-fire peanuts are faster, deal more damage and inflict more knockback, and cannot be grabbed or reflected. A fully charged shot from the Peanut Popgun deals 17% (12% in SSB4) damage, while a peanut inflicts 8% (5% in SSB4) damage when fired during the Rocketbarrel Boost. In Brawl, when Diddy Kong misses an opponent with shots from Rocketbarrel Barrage, or if the Peanut shell launched from his Peanut Popgun attack is damaged by the opponent's attack, the shell will shatter, leaving behind its fruit. The leftover Peanut can then be eaten like food to heal 2% damage each. There can only be 4 of these Peanuts on the stage at once. Peanuts originated in Donkey Kong 64, where Diddy Kong could obtain the Peanut Popgun as a weapon and fire peanuts as ammunition. The Peanut Popgun became a trademark for Diddy Kong, and returned in many later games. No characters in the Donkey Kong series, however, could eat the peanuts after they were fired, making it a unique element to Smash. This page was last edited on December 18, 2018, at 20:00.